“Asian Review 038” ― Jakarta part 5 Construction of JMRT with an aid from Japan – Yoshimura Planning & Appraisal Co.,Ltd. Trans-Jakarta’s golden line is the line “1” connecting Kota (Kota Tua) and Block M. This line runs a dedicated lane closer to the center of Tamlin Street – Sudirman Street, which are representative streets of Jakarta, and can reach the destination faster than a taxi or a private car at peak traffic congestion in the morning and the evening. 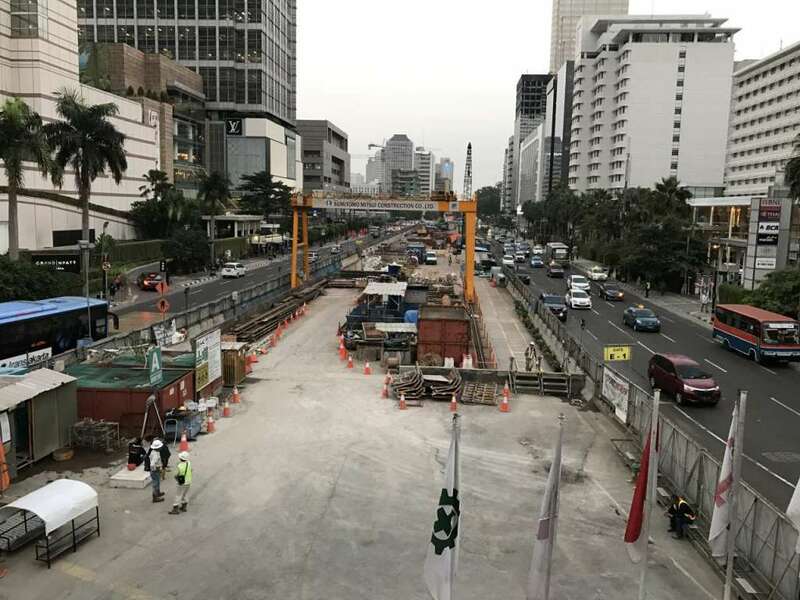 Currently, JMRT (subway: Jakarta city high-speed railroad) is built along this route and the phase 1 section including 13 stations in the south-side of the total of 21 stations will run operational tests until February and launch in March. Japan’s International Cooperation Organization (JICA) has financed ODA loans, and two consortium formed by Japanese companies are receiving orders for railway systems and vehicles, and their relationships with Japan are deepening. In big cities like Jakarta, aiming for TOD (public transport-oriented urban development) is an essential condition for sound development, but the biggest challenge I suppose is the lack or narrowness of road sidewalks from the subway station to the destination which is making this difficult to walk. In addition, people are used to commuting by motorcycles so much that they will take time to accept the new commuting style such as walking to the nearest station, taking a subway and walking from the station to the work place. Actually, some people pick up Bangkok in Thai as an example saying it was ten years after the subway started operation that citizens came to use it usually. Recently, the 3rd terminal of Sukarno Hatta Airport has been upgraded and at the same time, the train connecting the airport to the city center Dukuh Atas launched. It takes 45 minutes, relative slow as a train, but it certainly gave us new option for the transportation without being anxious for the traffic congestion. However, I am afraid this train may not be used so much until it becomes possible to read the time to get to Dukuh Atas station by taxi. 次へ Next post: “Asian Review 039” ― Jakarta part 6 How this country with variety will grow?